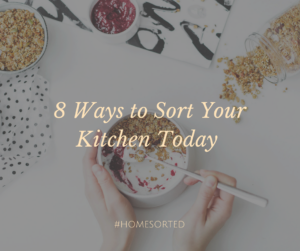 8 Ways to Sort Your Kitchen Today - Home Sorted! Have you ever struggled to get your kitchen sorted? Maybe it’s a mess of packaged food or cluttered cabinets that are getting you down. Fear not. We’ve grouped together our favourite tips for organising the kitchen. Go on, give them a try! A great way to get sorted is to organise items by frequency of use. We recommend storing everyday items on easy-to-reach shelves and lesser used items in hard-to-reach places, like top shelves or towards the back of cupboards. These spaces are perfect for special occasion platters or dining sets. It’s also a good idea to group similar items within your drawers and cupboards. This includes items such as bakeware, cookbooks, plastic bags and kitchen utensils. A designated bakeware shelf can be a lifesaver for the dedicated cook. Have you ever tried to find matching knives and forks in a disorganised drawer? It’s chaos. You simply must use drawer dividers – no exceptions! Pantry containers are a lifesaver in any organised kitchen. We recommend using labels to distinguish what’s kept inside each container. This is especially handy for baking products like plain flour, self-raising flour and caster sugar. Consider keeping snack foods in baskets within the pantry. They can be kept on lower shelves as an easy after-school option for school aged children. If you’re not using vertical storage you’re not making the most of your kitchen space. We love using magnetic strips for knives and frequently used utensils. These can be installed near the stovetop to ensure you have all the tools you need nearby when cooking. The same applies to hanging pots and pans near the stove top. Store a shopping list notepad in the pantry – as you use an item, add it to the list! Do you store cleaning products beneath the kitchen sink? If so, consider organising the space by installing hooks inside the door for cleaning cloths and a caddy for spray bottles. This also allows you to grab what you need and go! A must for any organised kitchen!